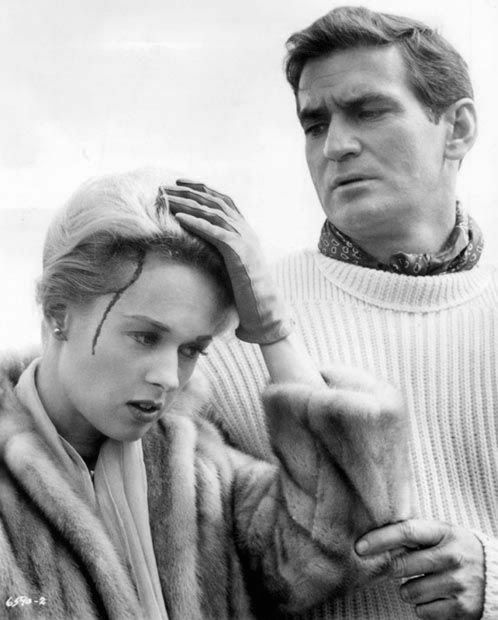 To create the desired dramatic mood shift, Hitch begins The Birds with escalating pranks between Mitch Brenner (Rod Taylor) and Melanie Daniels (Tippi Hedren), borrowed from the best of classic screwball comedies. This tactic not only created an initial romantic conflict but also deliver total shock to audiences when the expected bird attack actually happens. Irritated yet intrigued by her initial encounter with Mitch in a San Francisco bird shop, Melanie tracks him down to his family’s weekend retreat “about sixty miles north” up the California coast in Bodega Bay. Although Melanie tries to remain covert during her lovebird delivery mission, a group of squawking seagulls (foreshadowing!) betrays her position and a lighthearted chase ensues with Mitch behind the wheel of his truck as Melanie pilots a skiff across the open water. Romantic antics still dominate the general tone of the story, but when a seagull strikes Melanie’s head upon her return to shore to greet Mitch, the suspense permeates. Melanie caught Mitch spending a leisurely Saturday at his family’s coastal home. He’s dressed for casual comfort in a cream ribbed knit sweater and olive drab military-style cargo pants, adding a touch of idiosyncratic luxury with a silk cravat around his neck. 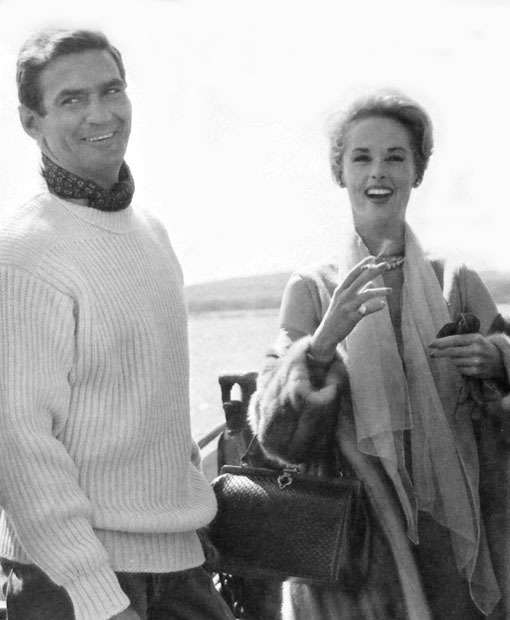 The cream sweater is worn in the seaside tradition of the classic Aran knit fisherman’s sweater, though Mitch’s heavy crew-neck jumper is stitched in a less complicated rib knit. The soft wool material is possibly cashmere. An amused Mitch spies Melanie making her attempted escape. 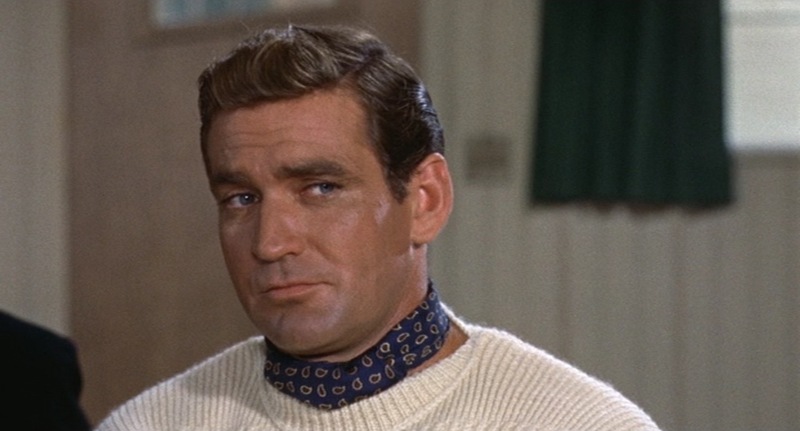 Around his neck, Mitch wears a silk kerchief patterned with paisley droplets on a solid navy ground that nicely brings out Rod Taylor’s blue eyes. It is worn like a traditional day cravat, tucked into the front of his sweater. No less amused but perhaps more concerned about Melanie’s recent gull strike, Mitch and his new companion exchange bon mots. From the waist down, Mitch’s casual wardrobe is the same functional attire that he would later wear with his gray tweed suit jacket and white shirt on the day of the actual avian invasion. His olive drab cargo pants resemble the OG-107 herringbone twill (HBT) cotton utility trousers issued by the United States military during World War II, indicating Mitch’s wartime service. The only pockets are the large bellows pockets on the outside of each thigh, which each close with a single metal button through a rectangular flap. He wears them with a thick dark brown oiled leather belt with a round-cornered brass single-prong buckle. 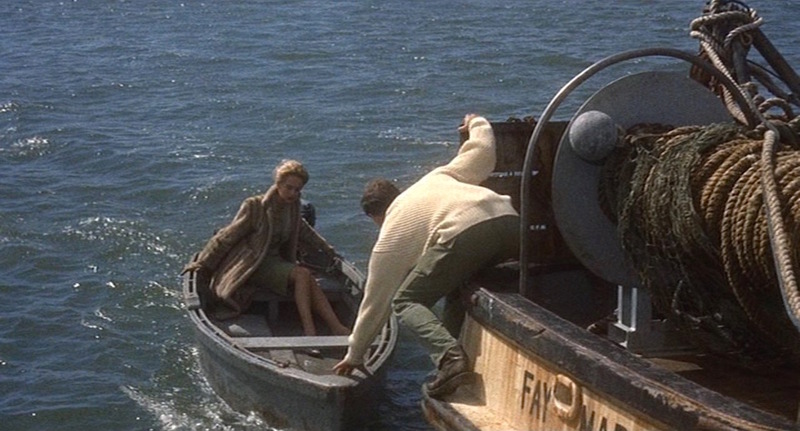 Mitch guides Melanie back to Bodega Bay. Mitch wears his brown leather civilian work boots with four brass eyelets and tan stitching on the moc-toe, on the quarters, and around the heelcap. The heavy brown soles have yellow rectangular logos on the arches that could help identify their maker. He likely wears them with gray socks as he does with the tweed jacket and white shirt. One rarely associates military-style cargo pants with a silk cravat around the neck, but an individualist like Mitch Brenner is comfortable blending leisure and luxury however he chooses. You really like me, huh? The pants look very similar to WWII Herringbone Twill GI issue trousers. They have the same color, cut and large pockets. I just watched this film today: the outfit as above certainly conveyed luxury, warmth and practicality with an air of being ready for action. I hadn’t seen the film for many years, but remembered some of the scenes as they approached so it must have made an impression when I saw it on tv long ago! I was hoping you’d get around to this film someday. Brenner’s outfits are cool. And some of his later ensembles in the film work very well. Looking forward to more. Agreed! 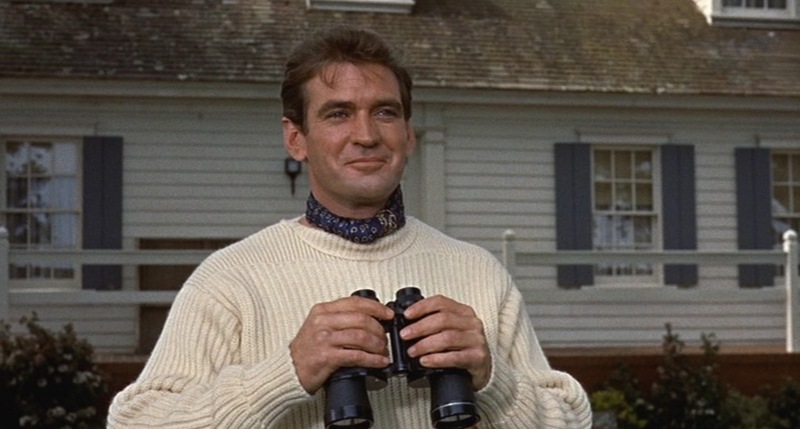 I’d love to get more of Rod Taylor’s cinematic style in general featured here. That’s what I get for posting comments late on a Friday night (my time). I’d completely forgotten about your other write-up two years ago. I blame that extra glass of red that I had with dinner (pizza. Home-made) earlier in the evening.